The cover also is highly water resistant, which means the seat covers can be wiped down without the worry of damaging the material. All seat covers come with applicable consoles (split bench rows only), airbag cutouts and pockets. Each piece is digitally cut to make sure that the finish product fits the exact specification of your vehicle seats. Also included is a thick layer of form backing for added comfort and protection. The Rhinohide seat covers are made for those looking for the ultimate protection for their vehicle with the elegant look of leather. Pattern Design. Fitting almost like an original upholstery, Coverking Custom Fit Seat Covers are developed with the use of advanced CAD (computer aided design) systems. Due to automation systems which integrate the CAD designs with computer aided manufacturing equipment each Coverking’s pattern is customized for the materials used in it. The design can take up to 3 weeks, but the congeniality of Custom is worth it. Custom Car Seat Covers by Coverking contain all headrests, armrests, map pockets, console covers for split benches, seat adjustment cutouts and airbag cutouts to deliver convenience to customers. Unique by their nature, they do not limit the seats’ functionality. 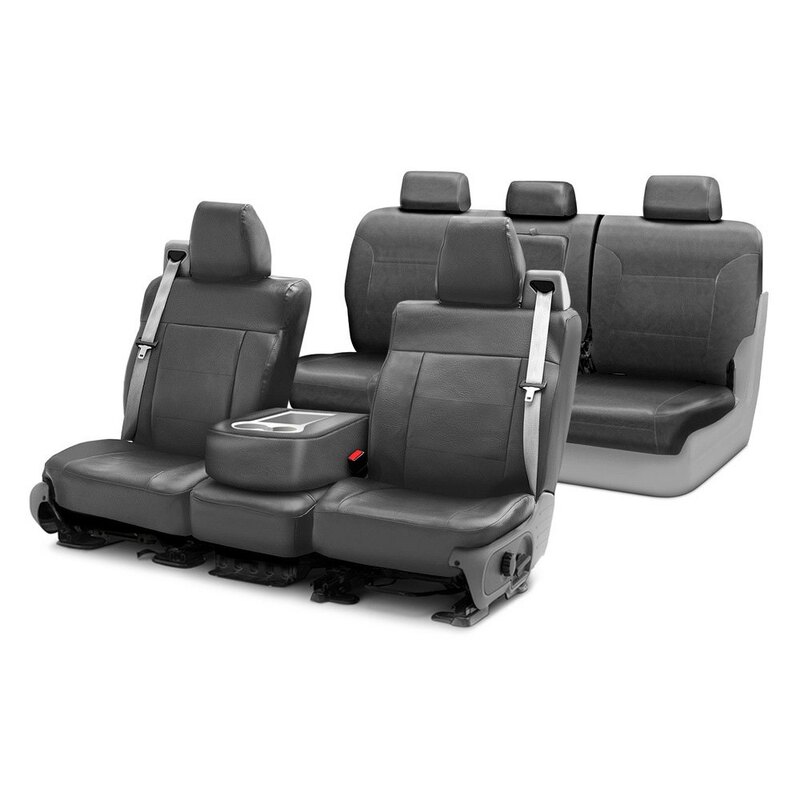 You will find Seat Covers to fit any needed applications, including the middle and rear seats for multiple rows of passenger seats, for all vehicles. Coverking’s Custom Seat Covers are designed and produced answering the standards of the industry and demands of the most spoiled clientele. They cover both factors: easy installation and perfect fitting. Material. Taking into consideration a non-suitability of one and only material for all conditions, presents a line of seat cover materials to satisfy various customers’ demands. Developed for certain needs, these materials answer the most demanding standards. Coverking pre-tests its Seat Cover materials in order for them not to fade or wear out. In addition, they are flame resistant. Along with their high durability, the comfort and flexibility comes. Most of them do not require participation of the upholstery professional for installation. Offering only high quality, most Coverking’s fabrics don’t require dry-cleaning. They feature astonishing and stylish appearance, that catches the eye and is a pleasure to touch. The variety of colors offers individuality and originality everyone needs nowadays. Created both for luxury cars owners and for active lifestylers who don’t have much time to take care of car’s interior, these materials are comfortable and easy to use. No Charges. No “Extras” Needed. Coverking seat covers always comprise every interior option. Selling each ready-made product as a complete set, Coverking doesn’t charge extra money for armrests, map pockets or airbag cutouts, etc. There is no other option for you to get in your order – but a complete set with everything included, at the offered price. Cover the Seats, don’t Hinder the Functionality. Coverking designed Custom Seat Covers to deliver maximum comfort and keep the vehicle seats’ features, such as the airbags, seatbelts, and even electric massage, fully functional. It was of vital importance in cover creation process to provide the client with full functionality of the car seats. That’s why Coverking’s Custom Seat Covers are compatible with seats having integrated airbags, headrest, armrest and console covers. Custom Seat Covers for middle and rear seat rows are also available, offering an option of folding down seat back and a free access to the trunk. Unlike simple cutouts made in other seat covers, the flap prevents wrinkles, preserving the shape of the seat. It is made of the same material as the seat cover to match completely. What makes these Custom Seat Covers distinctive from others is that they can be easily removed along with the seat from the vehicle, remaining on. With the seat cover on, seat backs and bottoms can be moved and adjusted inside the car as well.